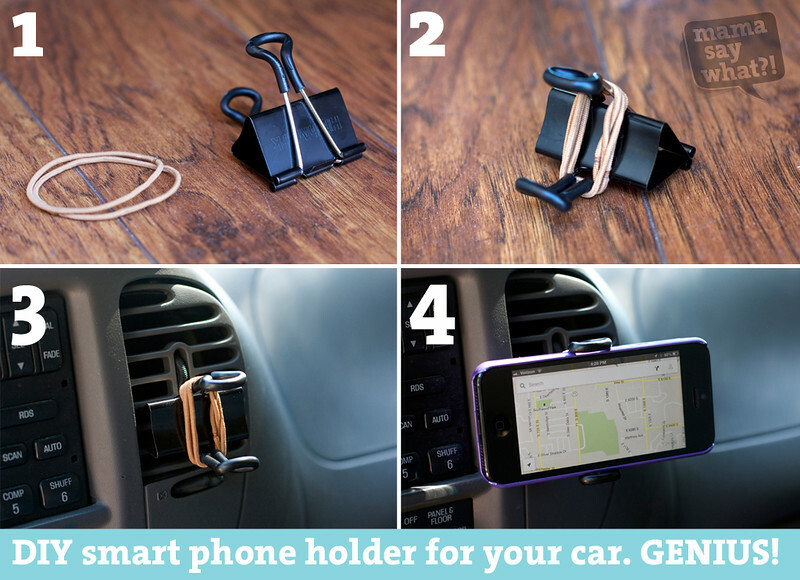 DIY Smart Phone Holder for the Car Mama Say What?! | Mama Say What?! I can’t take credit for the awesomeness that is this super simple and inexpensive smart phone holder for your car. My husband saw it on a random tech blog a while back and has been using it ever since. If he loses it or accidentally leaves it in a rental car, he just makes another one. When a friend or co-worker is totally wowed by it, he usually gives it to them them and makes another one. They are inexpensive and will hold a variety of different phones. I felt it was something that could be a nice tool for mamas too. 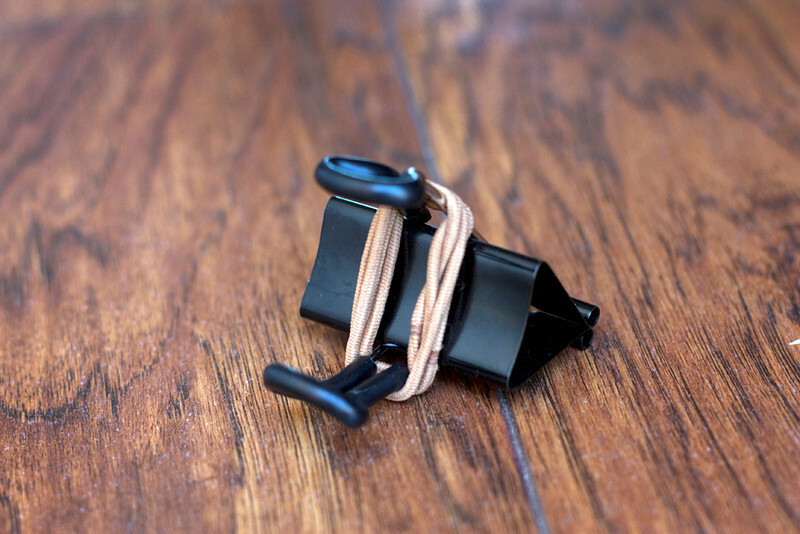 With a pair of pliers, grip the curved ends of the binder clip and bend them slightly so they will easily grip your smart phone. Depending on your grip strength, you may need two to get the job done. Wrap the rubber bands around the handles until they are snug. How many times you wrap will vary on what size rubber bands you have. 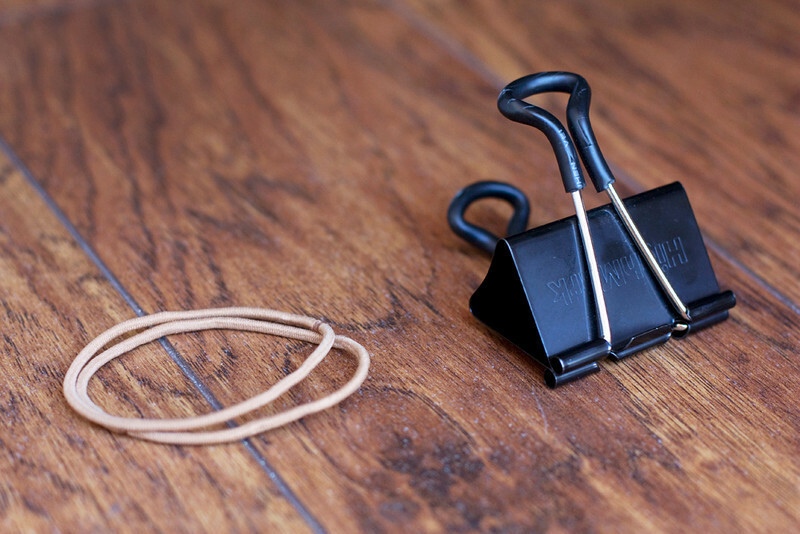 If you use really thick rubber bands, you can get away with just using one. 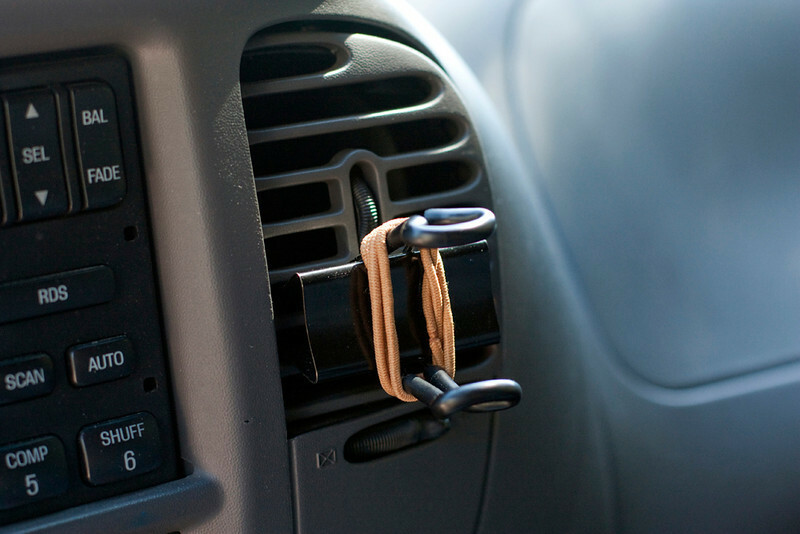 Attach the binder clip to a vent in your car. Attach your phone when needed. Your phone will be close by in case you need to keep it plugged in. Using Google Maps or Waze tends to drain my iPhone battery. You can pivot your phone how ever the vent will allow. You will need to cover the handles of regular binder clips with something soft so they don’t scratch your smart phone or phone case. Soft grip binder clips work perfectly. We have learned that the lifespan of regular rubber bands are cut short thanks to exposure to very hot conditions when sitting in the car. So we started using hair rubber bands. They still wear out over time, but they seem to last longer than plain rubber bands. When we’re driving and need to use the navigation system on the phone, this thing works like a charm. 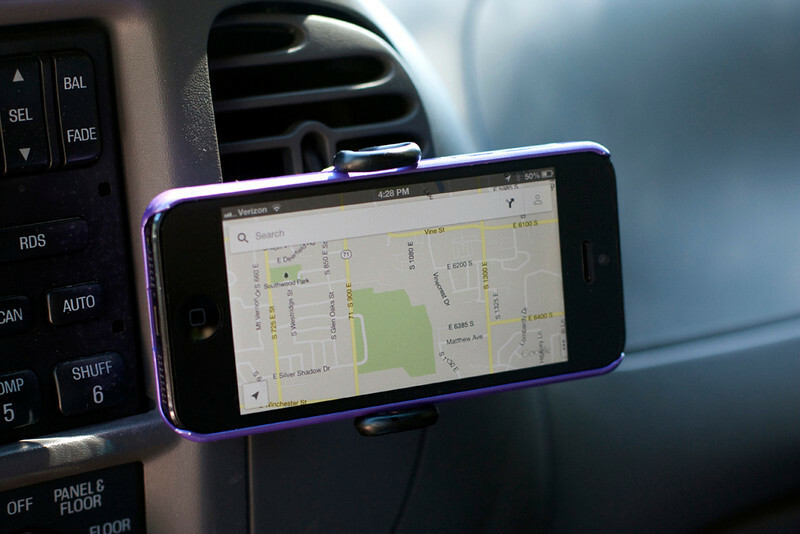 Do you already have a built-in navigation system in your car? It’s okay! I do and I still use this clip to play music on my phone and the clip makes it easy for me to change songs safely while driving. When our three-year-old gets really cranky I sometimes put on some music videos so he can watch from his seat. Obviously if the vents in your car run vertically, this may not work for you. If you have a different phone, either really small or really large, it may not work for you either. We know from experience that it will hold an iPhone 4S, an iPhone 5, an Android phone, and a big Samsung Galaxy S3. If it doesn’t work for your phone or car, you can give it away to someone who could use it. Heck, make a dozen and give them as stocking stuffers! Added by Alex T. on July 27, 2013. Oh my gosh, this is Genious! I have to try on my Android and see if it works! I have been looking for a holder for when I nav on my phone. One question: Did you have any issues with it stretching and possibly breaking the vents in your a/c at all? We’ve been using clips like this for over well a year and we’ve never had any issue with the clip causing damage to the air vents. And we’ve used the clip in quite a few different makes and models of cars. My husband always brings one with him when he travels for work and rents a car. I need to find some clips…. Genius! I was wondering if you had any tips on how to bend the ends? I can’t seem to find a good way to hold it so it’s not difficult to bend. Thanks! Hi Anne! I have to admit, I always ask my husband to bend the ends, so I had to ask him how he does it. He said he often has to use two pairs of pliers and bend/hold them in opposite directions. He also said that using a vice can be helpful too. I am going to update the article to include that info since he forget to mention it to me when I was writing it. I think I’ll try and add a photo of him doing it too. Thanks for the comment! I can’t believe I never thought of this. Any tips on how to make a sunglasses holder?